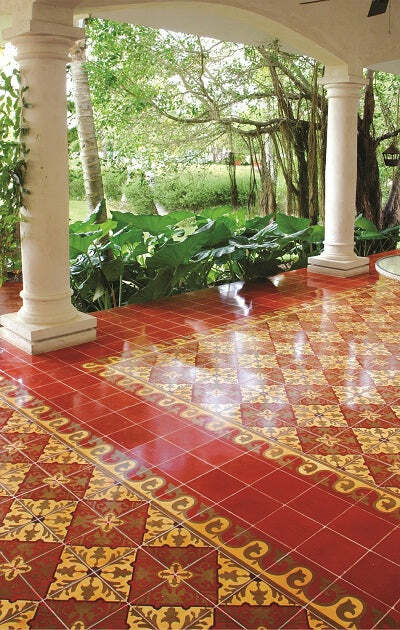 Handcrafted cement tiles provide both long life and distinctive beauty. This stunning Alcala cement tile pattern in a custom colorway creates an eye-catching floor with its showy pattern and border using warm colors and earth tones. You can achieve this dramatic look for about $10 a square foot. The border nicely frames the pattern in a room or hallway and is a traditional method of using cement tiles to create a 'rug'. Solid color cement tiles are used to fill the edge of the room and any irregular shapes outside the cement tile carpet. Using solid color cement tiles on the edge of the room also simplifies an installation because cuts don't effect the border or field pattern.